Definitely, it’s not the famous Cloud Forest in the country and there is not much information about Los Quetzales National Park. What if we told you there is a cloud forest 1 hour and a half from San José that few visitors ever see and you can see also the Quetzal? no gift shop, no snack bar, no crowds! We decided to explore this off the beaten trail with our friends who are Costa Ricans but they live in Spain and were visiting. They have passed in front of the entrance before without noticing that was there. It’s the latest National Park created in the country in 2006. The park is located on the Interamericana Highway and usually before Route 27 was built all people have to drive through “Cerro de la muerte”, which is the area the National Park is located at mile marker 76 to be exact. If you are visiting San Isidro del General (about 1 hour from the park) or Dominical Beach (about 2 hours from the park) you can add this option to your itinerary. Also, we highly recommended if you have time to spent the night in San Gerardo de Dota area. You don’t need a four-wheel drive to get to the ranger the station but the route is windy and steep so plan your trip accordingly. It´s not funny to drive in a curvy and foggy route at night! Wildlife: Birds around 200 species (including the Resplendent Quetzal), Baird´s Tapir, deer, pumas and so much more. The infrastructure of the national park is pretty much: The ranger station, the bathrooms and the parking lot. Circular trail: It´s about 400 meters (0,25 miles) long and can take you around 30 minutes to complete the loop that will take you to the ranger station. You can observe birds, plants like bromelias and the big trees cover with moss. Ojo de Agua Trail: It´s around 2 kilometers (1.25 miles) long. It can take you around 2 hours max 4 hours if you are walking slowly and taking your time for pictures. Good to observe birds and the vegetation typical from the cloud forest. How we got lost in the trails? So they said that due to the lack of staff they only have one trail available to hike but there is more and depending on the season of the year. We thought that we were doing the “Circular” but since the lack of signs, we started following a group of students. When we passed the group and walk waiting to see a turn or more sign but nothing, more than just the spectacular mist of the Cloud Forest. It was this feeling like we were “on our own” and not even seeing another tourist coming back, of course, we were enjoying taking pictures to the big trees but … we start to feel that we were going down and the trail starts to be narrower and with more plants. Something wasn’t right. So we decided to return before gets dark. So we got after the time the park close to the ranger station about 4:30 pm and the ranger was not happy at all! He complained that we took the “Ojo de Agua” trail instead of the “Circular” no wonder why we never did a circle and there was no sign that says the limits of the park so apparently we went to some sort of private property. Sorry! Learning lesson: The National Park finishes where this sign is and after that, you are in private property. Important to know! Make sure to know which trail you are doing because you won’t find a lot of information inside the park. Are you be able to see Quetzals? The quetzal season is usually in the month of March and July and the most popular place that people go to see them is Monteverde Cloud Forest. However, there is this less-known spot that you might be really lucky if you see it jumping in the branches at Los Quetzales National Park. The reality is always will be more possible to spot birds if you are going with a local tour guide that knows the behavior of the bird’s species. The Quetzal is not the exception. So if you really are chasing the Quetzal investigate the season and try to hire a local guide and also as we did if you don´t see it in the park be flexible to explore in the surrounded areas that your guide can recommend you. For example, in San Gerardo de Dota (close to the National Park) there is a family that has the blessing that Quetzals nest over a tree in their patio and for a small fee they let you photograph and you can have lunch there. 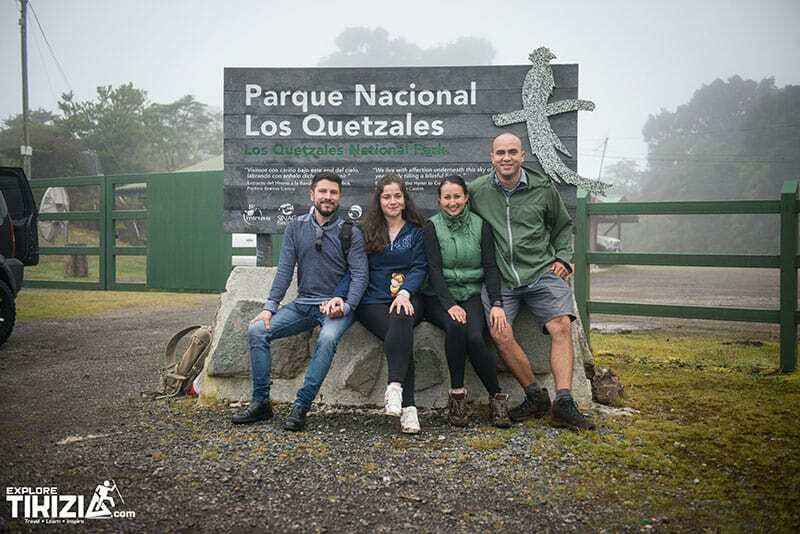 We did a mix of experiences visiting in the morning Los Quetzales National Park and then visiting San Gerardo area for few hours and drove 2 hours back to San José (85 kilometers – 53 miles). If you are a birdwatcher this area is the paradise, we knew the Quetzal season has been over and also there are other spots close by to do birdwatching. We also want to get the chance to check a spot that according to Costa Rica Birdwatchers Association you can see a special hummingbird that the last record was 25 years ago near the Poas Volcano. Locals called “Angelito” (little angel). He is very unique because the partial loss of pigmentation gives him the white color. Interesting fact (I love interesting facts): According to studies differs from albinism in the fact the melanin is, at least, partially absent but the eyes still have their usual color. We found this place that even some tourists from Spain were looking for after reading on TripAdvisor and they joined us since they also lived in Barcelona where our friends also have lived … what a small world! Miriam´s place is a small soda surrounded by a beautiful garden. Also some lodging options we saw. A small deck to observe and photograph the birds, where the birds visit the flowers and feeders. A few minutes later after our arrival, there was our friend “the White hummingbird” jumping flower by flower and showing his uniqueness. He was just soooo freaking cute! After having our delicious lunch the place became like a small UN office. All of them were chasing our friend so the place got full of tourist from France, Germany, Netherlands, Spain and who knows where else. Tourists with humongous camera lenses, families, couple who speak all languages and probably beside the restaurant owner, we were the only Costa Ricans but what made our heart happy is to see how they were enjoying our country. “Angelito” without knowing what makes him different also didn’t know how many benefits were brought to this family who owns the restaurant because after he showed up a lot of birders and photographers has come to the place. We witness a beautiful example of how you can do tourism, enjoy nature and benefit the local economies. What a joyful moment! Most of the hotels in the area are owned also by local families. Definitely, we can wait to explore more the area. So if you are visiting the National Park make sure to also visit this area. We are going to leave Miriam´s information in case you want to check it up. *We really like it, however, this is not an ad or affiliate link. AEAP: Costa Rica is the country that As Early As possible. First if you want to do birdwatching you know the earliest the better. The weather in the cloud forest might be sunny but the wet clouds can come anytime. Remember: Rain Jacket, sunscreen and hiking shoes are essential. You can have an extra pair of shoes some parts were really muddy, specially if you are going in rainy season. There is a famous cafeteria called Chespirito in front the ranger station if you want some chocolate or cup of coffee. Ask for a map or double check with the ranger the landmark that you need to know for your turning point. Expect basic infrastructure at National Park. The park accept credit card but always carry some cash in case of them not having signal. Hire a tour guide if you are really interested to do birdwatching. You can ask us about it and we can put you in contact with local guides from the area. ENJOY NATURE! NEVER FEED WILDLIFE!